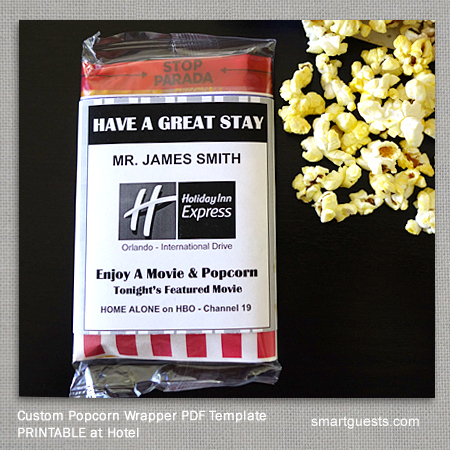 Surprise guests while improving your service scores with our Custom Popcorn Wrapper Printable PDF Template. Show loyalty rewards members how much you appreciate their business by handing this unique tool at check in. Great for any size, location, branded or non-branded hotels. Improve your sales and marketing efforts, How would the receipient of this sweet treat react? They will be WOW'd. It's fast and easy to implement at any hotel. Follow the quick how-to below and jumpstart your way to creating a engaging hotel experience for your guests. If you have any questions or special requests for your order, please email us. * No design or setup fees. * Encourages to post a positive review. * Perfect for local Sales & Marketing efforts too. Once you receive the template, you will be able add your own text into 3 seperate lines.